Do you know a child who loves ice cream and games? We do! Summer is coming, and there is nothing better than a big scoop of ice cream – covered in sprinkles of course. 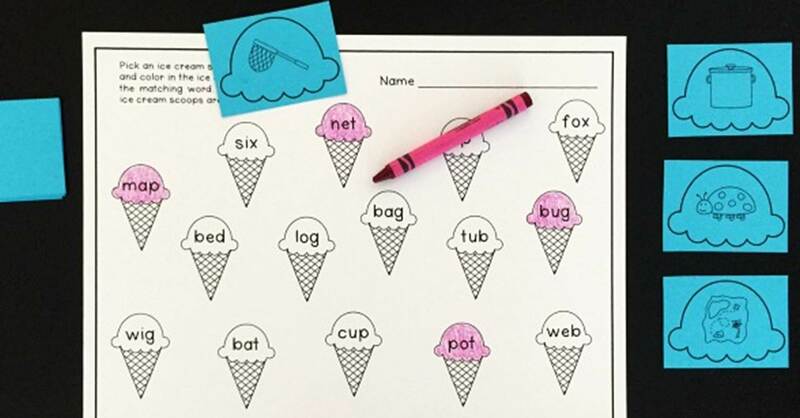 Our low prep ice cream scoop sorting game helps beginning readers put their skills to work finding the middle sounds in simple short vowel cvc words. Put those sorting skills to practice and build delicious looking ice cream cones at the same time! 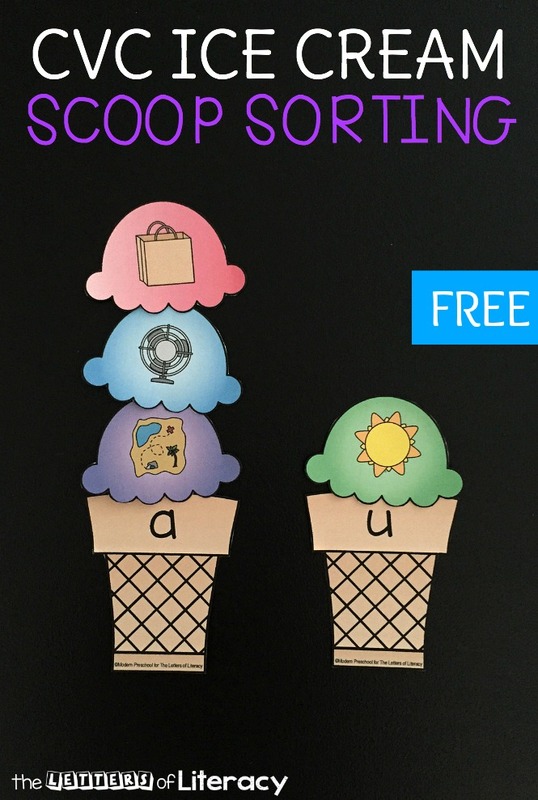 This printable activity includes 5 ice cream cones and 20 scoops of ice cream. Each ice cream cone has one vowel printed on it. The vowels include a, e, i, o, and u. Each ice cream scoop has an image of a CVC (consonant vowel consonant) word on it. 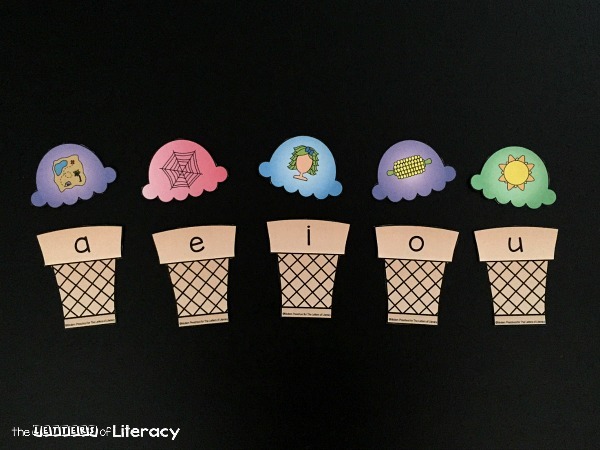 When the scoops are matching up to the corresponding middle vowel sound, there are 4 scoops for each vowel sound, or ice cream cone. Simply print the activity (below) and cut out all 25 pieces. 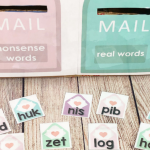 You can choose to laminate this activity if you are using it in a classroom setting, or just print it on cardstock for extra durability. The object of the game is to build each ice cream cone treat by sorting all of the scoops of ice cream. Each ice cream cone will have 4 scoops of ice cream that will include one of each color. 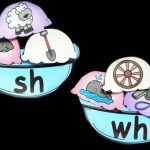 There are a few different ways to play and practice the short vowel sounds in the CVC words. The basic way to play would be to put the ice cream cones in a row and spread the scoops out around the table or floor. One by one, add the correct ice cream scoop to the corresponding ice cream cone that has the correct middle sound printed on it. 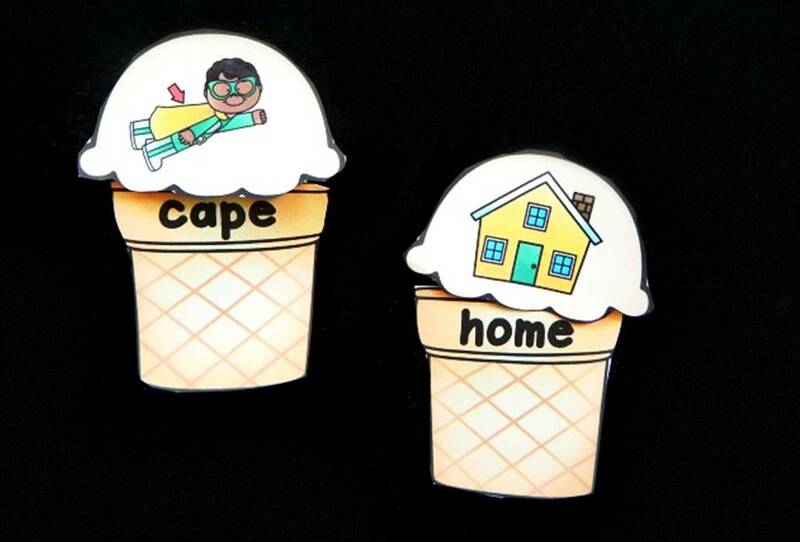 For example, the scoops with the hat, map, sad, and bag images on them will be added to the cone with the a on it. 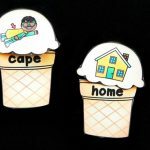 If the focus is on one vowel sound in particular, only use that one ice cream cone with all 4 corresponding CVC word scoops, but add in extra ice cream scoops. The object will be to differentiate between the specific vowel sound that you are focusing on, and the non-examples. 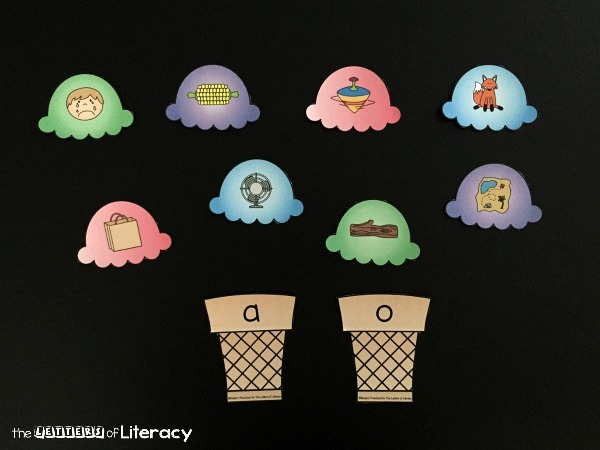 For a more beginner version of the game, include just a couple of ice cream cones and corresponding CVC word ice cream scoops. 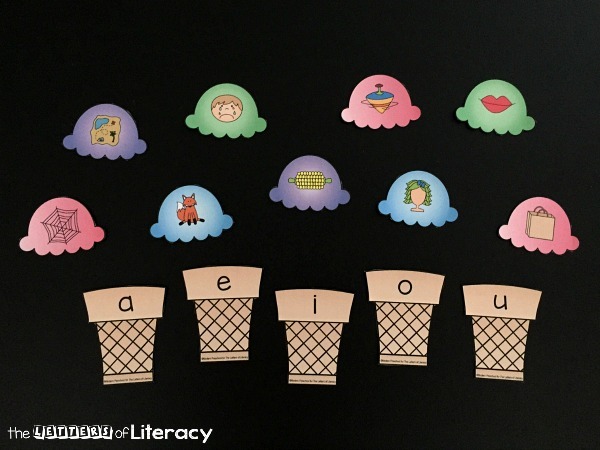 This will encourage the focus to be on fewer vowel sounds at one time. 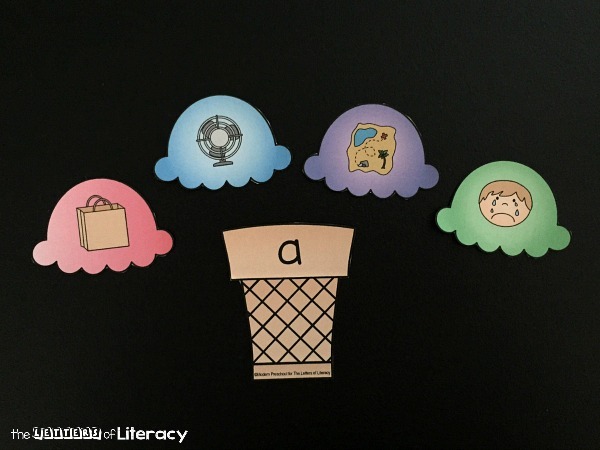 Mastering 1 or 2 vowel sounds, and then adding more parts of the game will help build confidence! 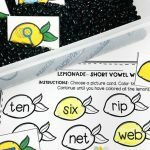 This printable game can be used as a literacy learning center in your classroom or as a busy bag activity at home. 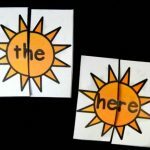 My preschooler loves when I make these kind of games because after I use them in my classroom (or share them with her teacher), I bring them home for her to play too. Store in a reusable plastic freezer bag to keep your pieces organized until it’s time to play again! 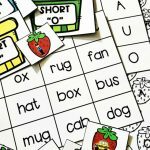 Ready to practice using those short vowel sounds? 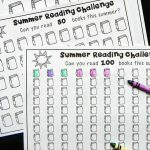 Grab your free printable copy by clicking the blue button below. 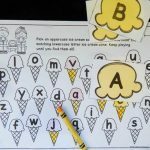 Enjoy a real ice cream treat after playing for even more fun, or scroll down for some more of our favorite ice cream printables and activities. Looking for more fun ideas with an ice cream theme? Here are some of our favorites!